Everyone loves pizza! Unfortunately, the best pizza dough recipes out there (either online or in restaurants) typically call for high gluten flour, mainly due to gluten being the best binder for the dough. And since most of us have had to cut gluten out altogether, then that doesn’t work. So many of you have probably tried the GF pizza options that are out there. And like me, if you’ve ever had a good thick pizza crust, then you have been sadly disappointed in the options that are out there. Before I was diagnosed, I had a really good crust recipe that was light and airy with a lot of flavour. I tried it out recently with GF flour and it at least produced a thicker crust than those other paper thin options. I will continue to experiment and try to pinpoint improvements and other options. Combine about 2 1/2 cups of flour with the other dry ingredients up to the yeast, mixing well. In a small pot, bring the rest of the ingredients up to a temperature of 120 degrees. That it just about before it boils but to be certain, use a candy thermometer to verify the temperature. Slowly pour the hot milk, water and butter into the flour mixture and mix together until it starts to become sticky. Pour the mixture onto a floured countertop and then slowly add in a little bit of flour until the mixture seems more like a small ball than a small puddle. Don’t add too much flour because your dough will be very heavy then. Preheat your pizza stone in the oven at 450 degrees. Basically when you start the dough it will be very rough and tend to want to fall apart since there is no gluten to help bind it. What you want to do is knead your dough and ensure that all the ingredients are mixed well. To knead your dough, put both hands on the ball and push forward with your palms like you were almost trying to flatten out the end of the ball. Fold the mixture back over the flattened part so that it’s like a ball again and repeat. Each time you repeat this make sure that you turn the dough so you are not just flattening the same side each time. A tip on keeping the dough from sticking to your fingers and the counter is to keep the area dusted with flour. Pinch off a small portion of it about half the size of an egg. Using your fingers spread the dough into a small disc rotating it until it is thin in the middle. If you can do this without actually creating a hole in the dough and you can see light through the thin membrane then your dough to proof. Unfortunately your dough will not rise that much considering the lack of gluten. 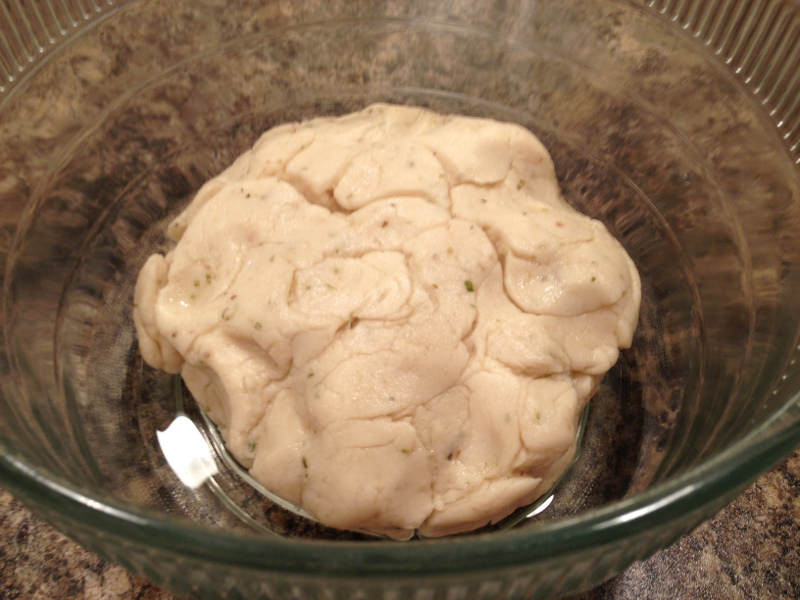 That said, put the dough ball in a oiled bowl and let it proof for about 15-20 minutes. Take your dough ball and spread it out carefully on the stone. Make a pizza shape and then put it in the oven for about five minutes without the toppings. Flip your dough, dress it and let it cook for another 7-10 minutes. The dough will look a little dark once you flip it, but this will help for the dough to cook throughout after you load your pizza with toppings.